People watch a TV screen showing images of U.S. President Donald Trump, left, and North Korean leader Kim Jong Un during a news program at the Seoul Railway Station in Seoul, South Korea, May 25, 2018. North Korea said Friday that it was still willing to sit for talks with the United States “at any time, (in) any format,’’ after President Donald called off a summit with the North’s leader, Kim Jong Un. Vice Foreign Minister Kim Kye Gwan, a longtime nuclear negotiator and senior diplomat, said in a statement carried by state media that the North is “willing to give the U.S. time and opportunities” to reconsider talks that had been set for June 12 in Singapore. Trump canceled his planned summit with North Korean leader Kim Jong Un, blaming recent threatening statements by Pyongyang to pull out of the summit over what it saw as confrontational remarks by U.S. officials. “I believe that this is a tremendous setback for North Korea and, indeed, a setback for the world,” said the president in noontime remarks in the White House Roosevelt Room before signing an unrelated bill. Kim Kye Gwan said North Korea’s recent criticisms of certain U.S. officials had been a reaction to unbridled American rhetoric, and that the current antagonism showed “the urgent necessity” for the summit. “We have inwardly highly appreciated President Trump for having made the bold decision, which any other U.S. presidents dared not, and made efforts for such a crucial event as the summit,” Kim Kye Gwan statement said. “We even inwardly hoped that what is called ‘Trump formula’ would help clear both sides of their worries and comply with the requirements of our side and would be a wise way of substantial effect for settling the issue,” he said, without elaborating. President Donald Trump speaks on North Korea in the Roosevelt Room of the White House, May 24, 2018. On Thursday morning, the White House released a letter Trump wrote to Kim saying: "I was very much looking forward to being there with you. Sadly, based on the tremendous anger and open hostility displayed in your most recent statement, I feel it is inappropriate at this time to have this long-planned meeting." According to a senior White House official, "the president dictated every word of the letter himself." North Korea's reaction was subdued and conciliatory. The North's official news agency put out a statement by Vice Foreign Minister Kim Kye Gwan saying, "We had set in high regards President Trump's efforts, unprecedented by any other president, to create a historic U.S.-North Korea summit. We tell the United States once more that we are open to resolving problems at any time in any way." But the statement said Trump's decision was not in line with the world's wishes and that Kim made the utmost effort to hold the summit. The North Koreans were a no-show for a preparatory meeting in Singapore last week, part of a trail of broken promises, lack of good faith and poor communication prompting the president's decision, according to administration officials. "We simply couldn't get them to pick up the phone," a White House senior official told reporters during a background briefing Thursday afternoon. The last straw, according to the White House, was an insult of U.S. Vice President Mike Pence earlier Thursday in a statement by North Korea's vice foreign minister, Choe Son Hui. She called Pence a "political dummy" and warned — in rhetoric typical of that uttered by Pyongyang — of a nuclear confrontation. In his letter, Trump responded in kind, referencing U.S. nuclear capabilities "so massive and powerful that I pray to God they will never have to be used." The Pentagon said it is poised for any "provocative actions" by Pyongyang. "We are in a boxer stance, we are ready to respond," Lieutenant General Kenneth McKenzie, director of the U.S. military's Joint Staff, told reporters Thursday. Trump emphasized in his on-camera remarks that sanctions and "the maximum pressure campaign will continue" to be applied on North Korea, while expressing hope Pyongyang's leadership would decide to join the community of nations. Trump's letter caught allies by surprise. The president did not call South Korean President Moon Jae-in or Japanese Prime Minister Shinzo Abe to inform them of it, White House officials confirmed. 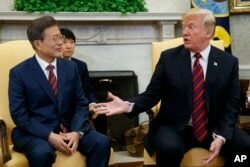 Moon hastily convened a middle-of-the-night meeting of his top security officials before expressing "deep regret" over the summit's cancellation, urging direct talks between Washington and Pyongyang and adding that denuclearization of the Korean peninsula should not be delayed. FILE - President Donald Trump meets with South Korean President Moon Jae-In in the Oval Office of the White House, May 22, 2018, in Washington. North Korea had threatened to pull out of the unprecedented summit after U.S. officials called for the so-called Libya model approach, which involved that African country's total nuclear dismantlement before any concessions were granted. 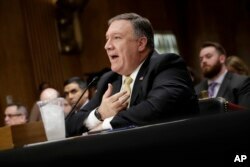 Secretary of State Mike Pompeo, in Senate testimony Thursday, when asked about his meetings in Pyongyang with Kim concerning North Korean total denuclearization, responded that "there was little doubt in my mind that he understood the scope of what we were asking for." Secretary of State Mike Pompeo answers questions from the Senate Foreign Relations Committee on Capitol Hill in Washington, May 24, 2018. A number of analysts tell VOA News there could still be a Trump-Kim summit soon. "Don't cancel your reservations for Singapore just yet," former U.S. deputy secretary of state Anthony Blinken told VOA's Korean Service. "This is unlikely to be the final word. President Trump and Kim Jong Un are engaged in a high-stakes game of chicken based on the shared assumption that the other wants and needs the summit more." According to Massachusetts Institute of Technology associate professor of political science Vipin Narang, "This is an inflection point in the administration policy toward North Korea." Narang, an author of two books on nuclear strategy, told VOA News that "one camp may prefer to see if working-level diplomacy can get things back on track, and maybe eventually get to a summit. Another camp may try to use this as evidence that diplomacy is doomed to fail, and that denuclearizing North Korea by force — attacking a nuclear weapons power — is the only remaining option." The hardline camp would be emboldened and empowered by any future North Korean nuclear or long-range missile test, predicts Narang. "So, if Kim is truly interested in some deal — well short of disarmament, obviously — his smartest move now is to exercise restraint." 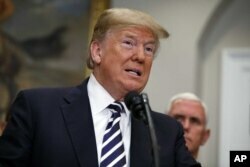 Trump has responded to North Korea in "a particularly ham-handed way," according to John Feffer, the director of the Foreign Policy in Focus project at the Institute for Policy Studies. "Trump didn't just cancel the summit. He sent a veiled threat of using nuclear weapons. I hope this won't be his only opportunity to help resolve the conflict with North Korea." VOA Korean Service contributed to this report. Can Trump Guarantee Kim Will Stay if North Korea Denuclearizes?